210 pages | 34 B/W Illus. 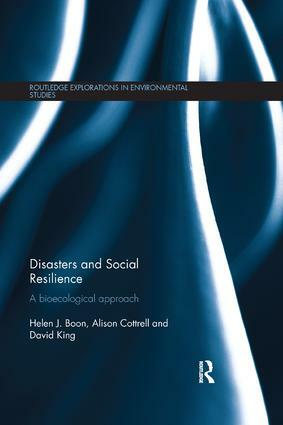 "The book makes a useful contribution to disaster management by highlighting the complexities of the concept of social resilience in the context of disasters. It provides an opportunity for the reader to reflect on social resilience and disasters." Helen J. Boon is a Senior Lecturer at the College of Arts, Society and Education, Division of Tropical Environments and Societies at James Cook University, Australia. Alison Cottrell is an Associate Professor with the Centre for Disaster Studies and Associate Dean Research Education within the College of Marine and Environmental Sciences at James Cook University, Australia. David King is an Associate Professor in the College of Marine and Environmental Sciences at James Cook University, Australia, and is Director of the Centre for Disaster Studies, and the Centre for Tropical Urban and Regional Planning.